There are so many films out there that are so well known that it’s hard to know when you first heard of them. Casablanca, Gone with the Wind, Citizen Kane, The Exorcist and many more are films that have titles as famous as the people featured in them. These are films that not everyone has seen, but that everyone has heard of. Harold and Maude is another film that should be included in that list. I have no idea when I first heard about it, but its title is no less prominent to me. I avoided seeing this movie for a long time. The general premise sounded more like a joke than it did something I needed to watch. When asking people who’d seen it what it was about they’d say “A teenager falls in love with an old lady.” See what I mean? It sounds like some perverse joke, not like a charming and enjoyable way to spend 91 minutes. Upon discovering it on my on demand I decided it was finally time to give this little film the chance it should’ve had long ago. The actual synopsis for the film goes something like this: 20 year old Harold is obsessed with death and fake suicide attempts, much to his emotionally distant mother’s dismay. While attending a funeral, one of his favorite hobbies, Harold meets Maude, a 79 year old woman with a lust for living life to its fullest. The two become fast friends and soon teach each other that true happiness can come from the most unexpected places. This little film has had quite the rocky past. According to the film’s Wikipedia page, although the film itself was released in 1971, it didn’t turn any sort of a profit until 1983, which is when it’s true cult following began. According to the page, “Roger Ebert, in a review dated January 1, 1972, gave the film 1 and a half out of 4 stars. He wrote, ‘And so what we get, finally, is a movie of attitudes. Harold is death, Maude life, and they manage to make the two seem so similar that life's hardly worth the extra bother. The visual style makes everyone look fresh from the Wax Museum, and all the movie lacks is a lot of day-old gardenias and lilies and roses in the lobby, filling the place with a cloying sweet smell. Nothing more to report today. Harold doesn't even make pallbearer’,” it says. The thinking behind the film’s turnaround 12 years after its release is that, when originally released in 1971, the concept was too risqué, and the underlying themes were too darkly comedic for people to truly appreciate it. Certainly there was no explanation I could find that would fully explain why 1983 was the turning point for the film. And yet it continues to gain in popularity and cult status. In 2000 it made the AFI’s 100 years 100 Laughs Best Comedies list, appearing at number 45. In 2002 the film was ranked 69th in AFI’s list of 100 Years 100 Passions. In 2006 it was ranked 89 on AFI’s 100 Years 100 Cheers list. In 2008 it made 9th on AFI’s 10 Best Romantic Comedies of All Time, and in 2008 it ranked 65th among Empire's 500 Greatest Movies of All Time. Judging by these quotes, and others, it seems that Harold and Maude is one that everyone who truly loves the art of film should see more than once, and I agree. The deeper one digs in to the enigma that is this odd little film, the more one finds a multitude of reasons to watch it over and over. Be it merely to catch all of the methods Harold’s fake suicides; or an attempt to cement into memory all of the brilliant lines that Ruth Gordon has as Maude; or to make an effort to notice the little, more hidden details; according to what I’ve found this is a film that will (almost) never disappoint. 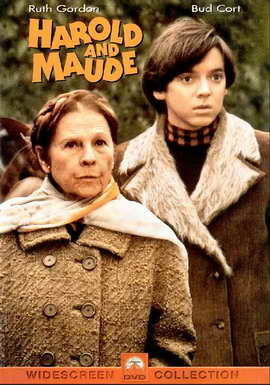 Harold and Maude is rated PG, was directed by Hal Ashby and stars Bud Cort and Ruth Gordon. It’s available now on Blu Ray, DVD, streaming and VHS (for the purists).